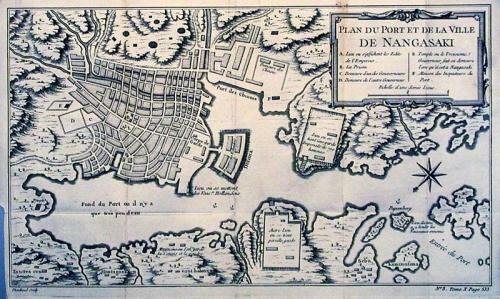 Title: 'Plan du port et de la Ville de Nangasaki'. A detailed plan of the city and port of Nagasaki on the Japanese island of Kyushu. The plan shows Deshima, a 130 acre artificial island in the bay of Nagasaki where the VOC (Dutch East India Company) were allowed to trade with the representatives of the Shogun in Edo.